That’s it. It’s over. For now at least anyway. If anyone ever suggests to you that changing the taps in the bathroom is a quick and easy way to ‘refresh’ your room, my advice is to punch them swiftly in the face. Our old bathroom taps were leaking and a bit manky so we decided to buy some more. We went to B&Q to buy some we had seen on the website that were in stock. We waited for them to come back into stock only to be told that they were no longer being manufactured. We went to B&Q and bought some different taps. 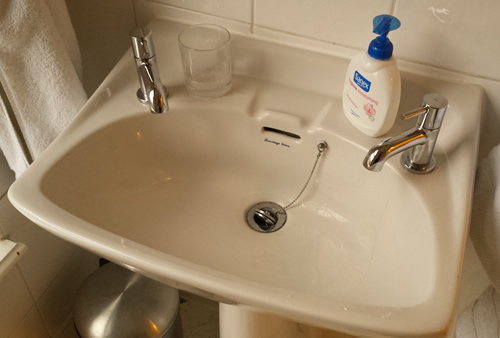 I decided to fit the sink taps first as they were the easiest to get to. In removing the first tap (the hot one incidentally) i managed to break the corner off of our 70ish year old ceramic sink. I decided to super-glue the sink back together. I super-glued myself to a sink for roughly 45 minutes. I got upset and re-fitted the old, manky, drippy hot tap. Sarah found a matching sink for sale on eBay. The man I bought it from packaged it up so well it added an extra 7 kilos of weight and clearly marked it as fragile ceramic. Parcelforce clearly mistook it for a football or something and promptly kicked it around a warehouse. Parcelforce delivered a very smashed sink. Parcelforce informed me that they do not cover for broken ceramic items. Subsequent attempts to purchase a second replacement sink have thus far failed. We still have manky drippy taps. 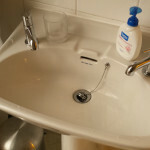 I get fed up and decide to fit the new taps again, despite still having a broken, albeit mended, sink. I decided to start with the bath as quite frankly I was scared of the sink. I took the side off the bath and discovered I would have to dismantle the end of the bath panel to get it off. In dismantling the end of the bath, I had to pull back the lino. In pulling back the lino I damaged the silicone seal round the edge of the room. In pulling back the lino I ripped the lino. 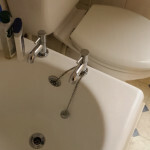 Having removed lots of wood and nails I eventually removed the bath taps. I put in the new tap to discover that the threaded bit on the bottom was roughly an inch shorter than the old taps. The pipework wouldn’t pull up to reach the new taps. Leaving the bath alone for a while I decided to remove the sink taps in the hope I would have more luck there. The old taps came out without issue. I cheered up a bit. I fitted the new taps. The pipework would’t reach these either. I went to B&Q to buy some flexible tap connectors to replace the length-challenged pipework, and some silicone. I forgot to buy the silicone. One of the flexible connectors I bought wasn’t long enough. I went back to B&Q and swapped it for a longer one, and bought some silicone. New taps were fitted and connected roughly 1 hour later. I rebuilt the bath and made a new end panel. I glued the tear in the lino. I replaced the silicone seal round the whole bathroom. I forgot to seal round the radiator pipes. This still need to be done. The sink is still broken. The lino is now torn a bit. I wish I’d never started. So there you have it… #TapSaga is complete. At least it is until Sarah finds a replacement sink on eBay and I have to start again. The bits I enjoyed the best were when you got angry. I enjoy the smug feeling knowing that I knew the sink before it was famous. Yes, that’s a happy thought to hold on to. The filth from my very own hands has washed down that sink. I’ve probably leaned on it at some point too. I think you and I can feel rightfully proud of our close connection with this sanitary hardware. So much of your hand filth was washed down into the darkest recesses of Kevin’s sewers, because that’s what they are. Kevin has dark recesses. I wish we’d gotten a photo now before all the chaos. You always come up with the best ideas too late, tsk. I too long for the unbroken sink of old… The times we shared, let me tell you, you could write a book. … or a blockbuster film? I’m going to wait for it to come out on video, and then borrow it from someone. That way it’s free. Okay I’ll buy the VHS and then I’ll lend it to you, but you’ll have to rewind it yourself.